The name, “Westhollow”, created by Donovan Lord, defines the Northwest Dallas neighborhoods West of Midway Road, South of LBJ Freeway, North of Walnut Hill and East of I-35 as “Westhollow”. See our Neighborhood Guide to read about each of our neighborhoods. 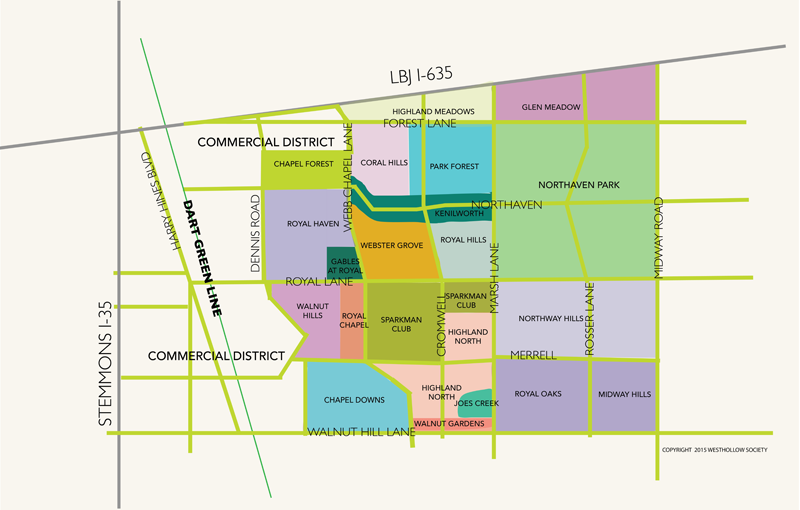 Some of the neighborhoods that are encompassed within Westhollow’s district are Park Forest, Royal Hills, Sparkman Club, Timberbrook, Royal Oaks, Royal North, Underwood, Northaven Park, Glen Cove, Highland Meadows, Coral Hills, Webster Grove, Walnut HIlls, Royal Haven, Chapel Forest, Chapel Downs, Walnut Meadows, Northway Hills, Midway Hills and Meadow Park.